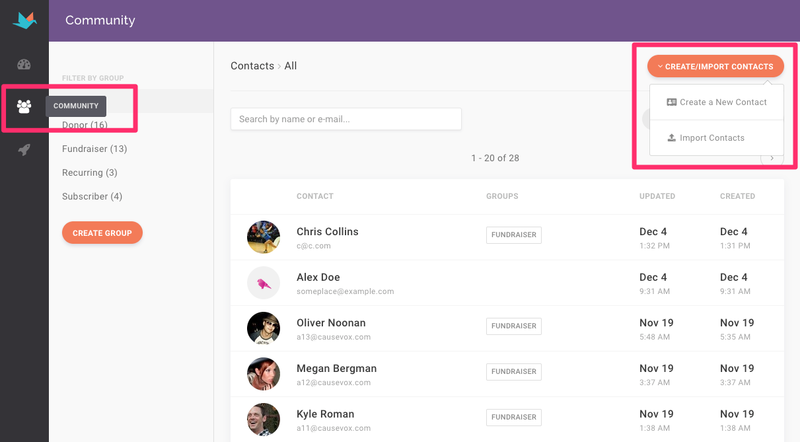 With the CauseVox Fundraising CRM, you can have a centralized fundraising CRM that provides everything you need to easily organize, track, and grow relationships with your community of supporters and fundraisers. Gone are the days you have to worry about manually managing your donor data and reconciling spreadsheets. With CauseVox Fundraising CRM, we make it easy for you by automatically keeping track of your community so you can spend your time building relationships with them. On you “Community” page, we collect information for your donors and fundraisers and arranges them into unique contact records, helping you get a keen insight into your community. You can also create custom groups to help you better segment your audience according to your needs. You may want to create groups for board members, volunteers, major donors, and more. With these filters, you can easily track the groups of supporters based on dates of activity and the action they took. This way, you can activate your community to get involved in your latest fundraising efforts, giving you the tools you need to you personalize your communications, strengthen relationship with your supporters, and help you raise more. Looking for a particular donor? You can search and select contact records from your community to view their profile. The profile pages centralize and track donations, fundraising activities, and engagement in real-time, helping you get to know your supporters. Should you need to update a contact name, email, or address, you’re able to easily edit a contact record. You're able to make notes on Contacts to help you keep track of activity or other comments on members of your community. Here's how you can add notes to a contact. We make it easy for you to add and import contacts into CauseVox so you can keep track of the activity of your community online over time. Here's how you can import contacts into CauseVox. The CauseVox Fundraising CRM frees you up. By having all your data saved in one place, it not only saves you time but also helps keep all your data easily accessible and organized, giving you more time to spend on engaging your community.